Butterfly pea flowers (layered ones on the right). You can also see glimpses of the white ones. 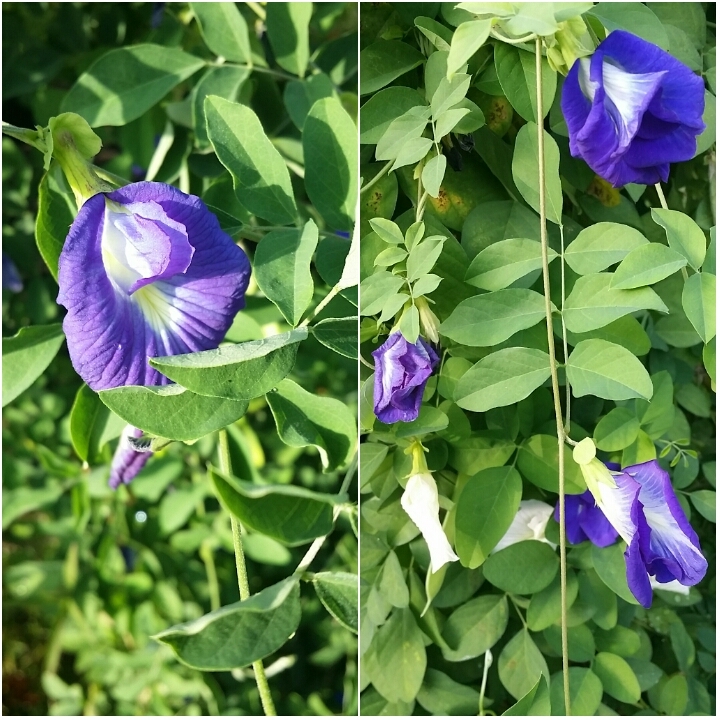 We have butterfly pea flowers in abundance in our garden! Once you plant them, they are unstoppable! Especially during rainy seasons, they will spread around like mad, climbing over anything around them, crawling all over. We have three types; purple single layer, purple layered, and white. The layered ones are very pretty they looked like roses! 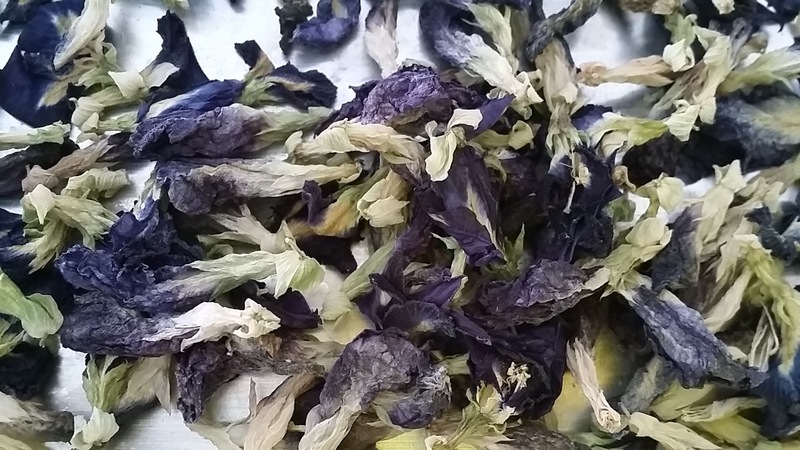 We would pluck the flowers and dry them out in the blazing sun for days before storing them away. 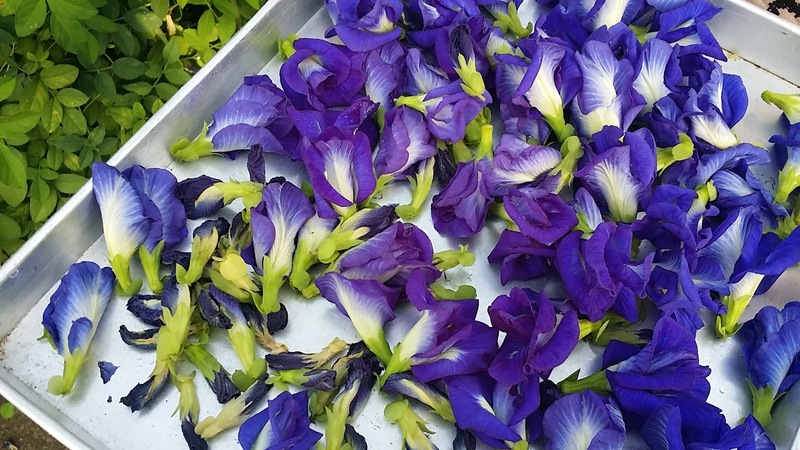 These flowers are full with antioxidants. A lot of benefits have been scientifically proven and some even stated it benefits woman the most, in terms of fertility and your menses. They are good for your hair too. I can't remember what brand, but there is one product that use these flowers as one of the main ingredient in their shampoo. Oh, they are also used in nasi kerabu, too! As for me myself, I drink this to clean my body from toxic. The boys in my family sometimes consume it, too. Especially after we ate out or just had a not-so-healthy meal (fast food, fried food, junks... and neslo ais, in my case), we'll drink this and it will flush them all out! Leaving your tummy feeling so clean. Works almost like julap... Hahaha. Sometimes I take the fresh ones to put in my drink. I had them in either hot chocolate, horlicks, or coffee. 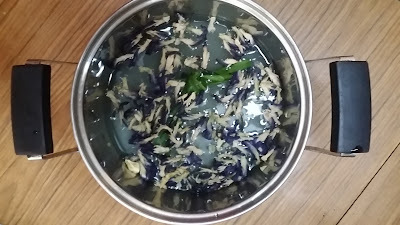 Tried adding them in my tea but the colour didn't turn out nice and the taste didn't get along well too. 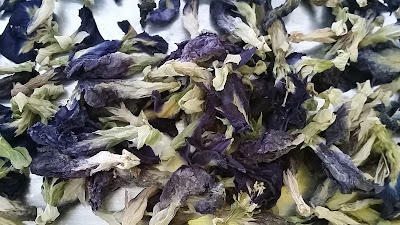 Sometimes I also made it just like a tea; butterfly pea tea. 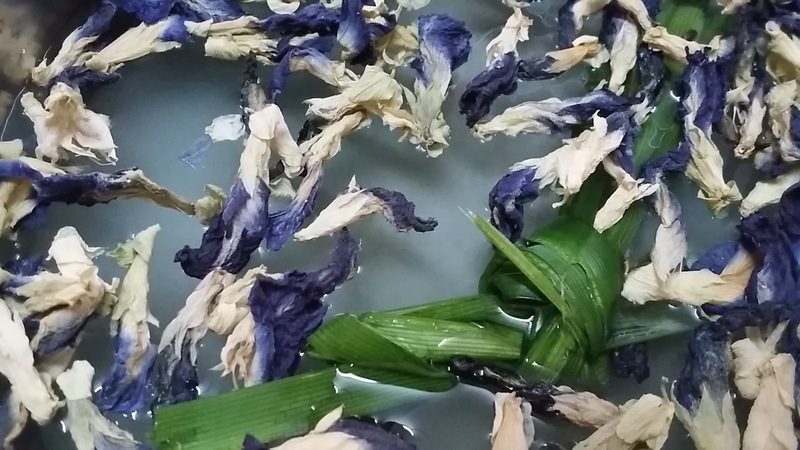 Just put boiling water over the flower (dried or fresh) and there you go, a nice blue butterfly pea tea! It tastes really fresh! I like to add lemon juice as it makes it taste even more fresh. 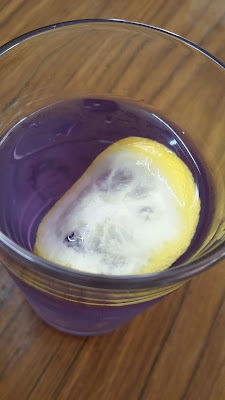 And the amazing thing is when adding lemon juice, it will turn into a nice purple colour! Morning harvest! White ones included! Butterfly-pea flowers (layered ones) picked and ready to be dried out under the blazing sun for a few days. These were already dried for two days. Still have to dry them out for a few days more until they became crispy so that we can store them for a longer period. 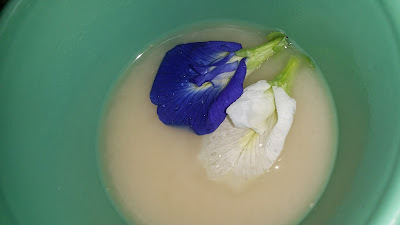 Blue and white flower in my hot horlicks every morning! Add lemon juice and it will turn into purple! 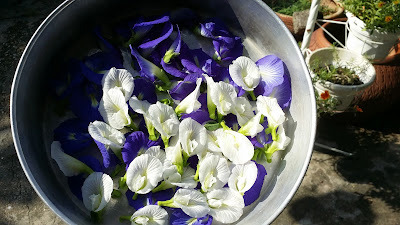 Recently mum found out we could make sirap telang with these flowers. 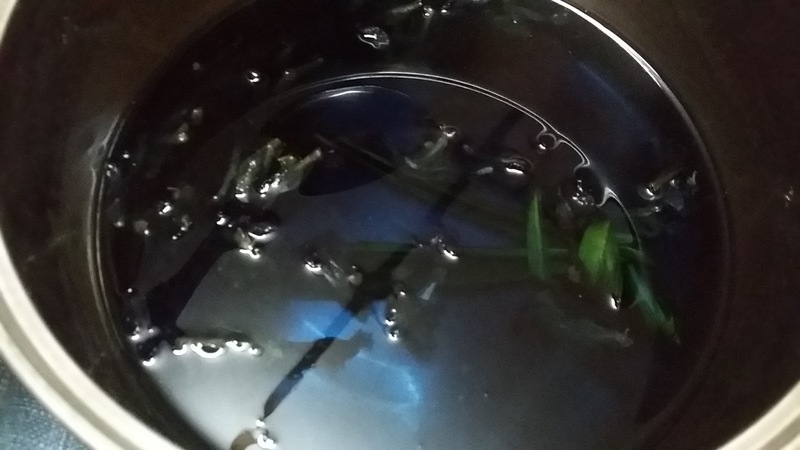 Just like how you make the red air gula sirap, where you boil sugar, water, sirap ros, and pandan leaves. It is the same with these butterfly pea flowers. 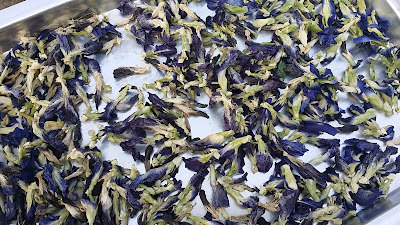 It is advised to use fresh ones but since we had a lot of dried ones, we just use them up.